Reklamen is the German word meaning "advertising". 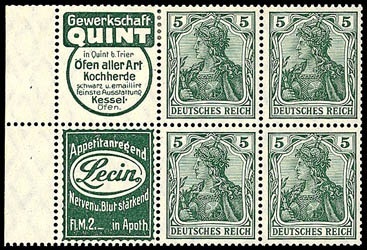 The German Empire advertising label stamp booklets, issued between 1911 and 1912, are among the rarest and most sought after items in all of German philately. MH (stamp booklets), markenheftchenblätter - HB (stamp booklet panes), and zusammendrucke - ZD (combination pairs), from the Michel Deutschland Katalog. 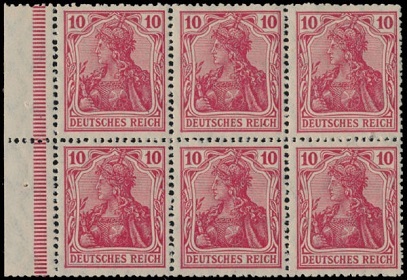 stamp booklets contained two panes of six of the Germania 10 Pf. two blanks with St. Andrew's crosses. These panes are cataloged as HB 1 I, HB 2 I, and HB 3. These first booklet panes are expensive in themselves, with hinged examples of the peacetime printings being priced at between 300 and 1,500 Euros each. As is the case with the sheet stamps, the "wartime printings" of the first two panes, cataloged as HB 1 II and HB 2 II in Michel, are much less expensive. HB 3 only exists in the "peacetime printings". Beginning in January 1911 and continuing through May 1912, the Imperial Post began incorporating printed reklamen or advertising labels into the panes in each of the stamp booklets. 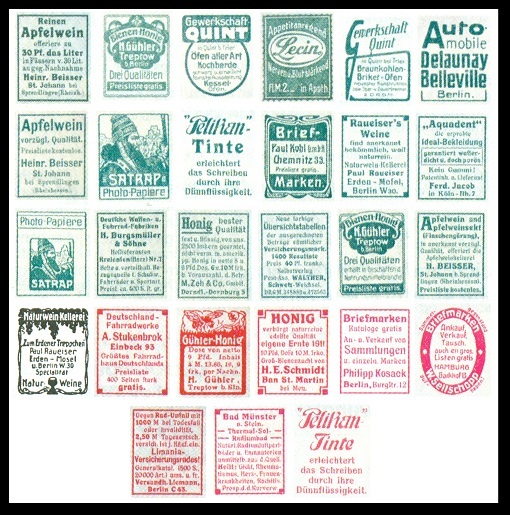 There were a total of 27 different advertising labels, randomly utilized on each of the panes of the stamps in the booklets. All of the known label varieties are shown in the graphic above. Of course, the labels on the 5 Pf. panes were printed in green, and the labels on the 10 Pf. panes were printed in red. Unexploded booklets containing combinations of these advertising label panes are priced at between 10,000 and 20,000 Euros each in Michel. about 400 Euros for the most common varieties up to 2,000 Euros for the scarcer varieties. thumb .... if you find one offered at under 100 Euros, BUY IT FAST! .... before someone else sees it and buys it. One could try collecting ALL of the reklamen label types in horizontal and vertical pairs (59 listed varieties), but that would require a monstrous investment. Many collectors / specialists are content with having a few pairs as examples of this brief and very interesting period of German philately. Myself ... I have a couple of pairs and a "stray" label attached to a postcard in my own collection. I'm happy with that. I found the postcard shown above on the German eBay site. Very interesting and NOT VERY expensive! 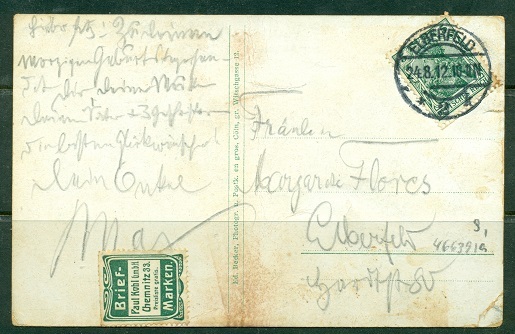 From the visible evidence, it appears that the writer finished writing and addressing their postcard. They then tore a 5 Pf. stamp from the booklet and affixed it to the upper right hand portion of the card. Not knowing what to do with the printed booklet label that was previously attached to the postage stamp, it appears that they then tore it out of the booklet and pasted it to the bottom of the message area of the postcard. If they only knew what they had done, at the time! Germania booklet panes were printed in large sheets containing multiple panes. These sheets were separated into panes of six stamps each, for inclusion in vending booklets. During this separation process, the outside perforations of the panes were sometimes mutilated or even cut completely off the outer edges. As a result of this separation process, booklet panes of this era generally have short perforations or even no perforations at all on the outer edges. Panes with complete perforations along their outside edges are actually scarce.